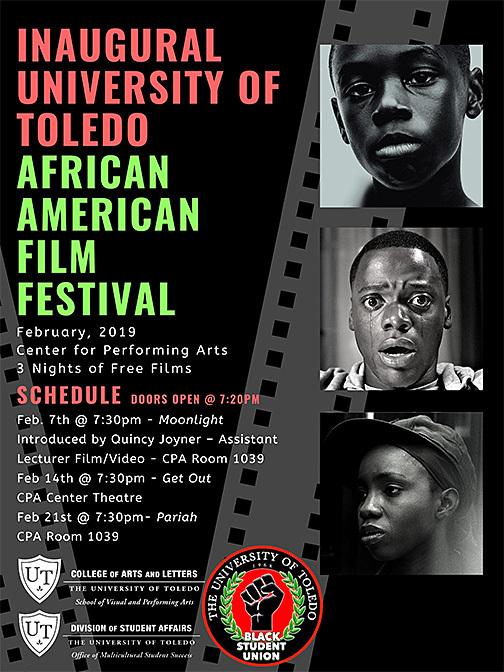 The first UT African-American Film Festival will be held this month at The University of Toledo. Screenings will take place Thursdays, Feb. 7, 14 and 21, beginning at 7:30 p.m. in the Center for Performing Arts. The inaugural event is co-sponsored by the UT Black Student Union, the UT Department of Theatre and Film, and the UT Office of Multicultural Student Success. Films showcased during February spotlight contemporary African-American stories as told by some of today’s best African-American filmmakers. Kicking off Thursday, Feb. 7, the festival will open with the 2016 Academy Awarding-winning best picture “Moonlight,” directed by filmmaking phenom Barry Jenkins. The following week, Thursday, Feb. 14, Jordan Peele’s contemporary horror masterpiece “Get Out” will provide entertainment on Valentine’s Day. “Pariah,” a quiet yet beautifully crafted indie film directed by Dee Rees, will conclude the festival Thursday, Feb. 21. “Moonlight” and “Pariah” will screen in the Center for Performing Arts Room 1039; “Get Out” will be shown in the Center for Performing Arts Center Theatre. Doors will open at 7:20 p.m. for the free, public screenings. For more information, contact Hey at holly.hey@utoledo.edu. This entry was posted on Tuesday, February 5th, 2019 at 3:15 am and is filed under Arts, Arts and Letters, Events, UToday .